Why are so many students dropping out? Posted by Katie in Quinnipiac University. Quinnipiac’s online independent student newspaper The Quad News wrote an article about this blog and QU’s efforts to improve the retention rate! Posted by Katie in College Students, Quinnipiac University. A recent survey of 100 Quinnipiac students found that 57 percent had thought about transferring at some point in their college experience. Many think this is due to the high cost of a college education, especially at a private institution such as Quinnipiac University. According to Maureen Tillman of the New York Times, “parents are viewing the cost of college with a stronger lens and are becoming more assertive by telling their children that unless they take their academic experience seriously, they will not continue to pay the high costs of going away to college as opposed to commuting from home.” In her article, Tillman quoted Mara Model, a former Quinnipiac student, who said she transferred to Temple University because she felt the QU campus was too small and isolated. Also in the survey, students were asked “why do you think most students leave Quinnipiac?” 40 percent said financial reasons, 38 percent said dissatisfied with the social scene or didn’t fit in, 17 percent said dissatisfied with housing and/or university rules and regulations, 3 percent said academics weren’t challenging enough, and one percent choose either academics are too challenging or a family or medical situation respectively. Allen Grove, in his article “5 Bad Reasons to Transfer,” said that challenging academics is the second highest reason people transfer – which is the opposite of what the survey at Quinnipiac showed. It shouldn’t come as much of a surprise that 17 percent were dissatisfied with housing because QU is going through such dramatic housing changes for this upcoming year. Nathalie Weinstein of the Daily Journal of Commerce wrote that “students that live on campus during their first year come back at a higher rate than students who live off campus” which is a piece of the puzzle for QUs new housing plan. 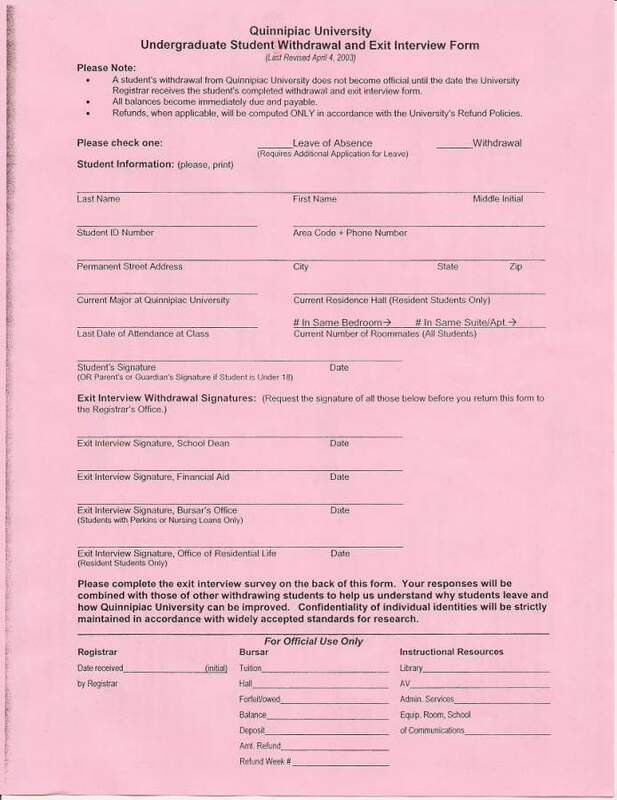 Governa thinks some of the questions on the back are “stupid.” He said “Why do they ask because they’re not going to change it anyway.” The retention committee is looking to make changes but they say a big problem is that not everybody fills out the withdrawal form. Nicole D’Allesandro is a former Quinnipiac student who transferred to UMASS Boston. She made her decision to transfer over the summer so she wasn’t at school to pick up a form. “They mailed it to me but I was already gone so I just didn’t do it,” she said. She wanted to stay at Quinnipiac and was frustrated when she left. She felt that no one helped her find a way to stay… so she didn’t feel obligated to do anything else for the school. Posted by Katie in College Students. This widget, available from Widgetbox, is called the College and University Planning Information widget. This widget tightly packages everything from College and University information, to tips on how to balance classes and clubs, to information about tuition costs, tips for parents, and of course… retention rates! This widget has been installed in 64 different sites.